Luc Salsendo is rather small having only around 30 seats, so it is probably best to make a reservation to be sure of a seat. The place even fills up nicely for sunday lunch; most of the customers on sunday rather mature in age, perhaps representing the more upscale neighborhood. The chef, Luc Salsedo is a young chef from Cagnes-sur-Mer with a very impressive resume including long stints in the kitchens of Chateau de la Chevre d'Or in Eze and Alain Ducasse's Louis XV in Monte Carlo. He keeps the menu limited with only 3 starters, 3 main dishes and 3 desserts. The menu changes every 10 days. David Rosengarten accurately describes Luc Salsedo style as "the kind of neo-bistro cooking that's sweeping Paris: the food combines grandmother cooking with the subtle creativity you might find in a one- star restaurant". I started with an excellent croussiant of shrimp which had nice asian influences. For the main dish I went with the duck confit which had an excellent duck reduction and was served with polenta on the side (served in a small decorative cast iron pot). A pear poached in red wine was used to garnish the duck and added nicely to the dish. For dessert I chose the warm chocolate cake which was good, but paired a bit in comparison to that of L'Ane Rouge. However, I expect L'Ane Rouge had their own pastry chef, while the kitchen in Luc Salsedo was limited to only 2 or 3 chefs. Overall, meal at Luc Salsedo was found to be more flavorful and creative than that at L'ane Rouge. I will definitely return since Salsedo changes his menu every 10 days. During Monday -Friday lunch, diners can choose two dishes for 25 euros. 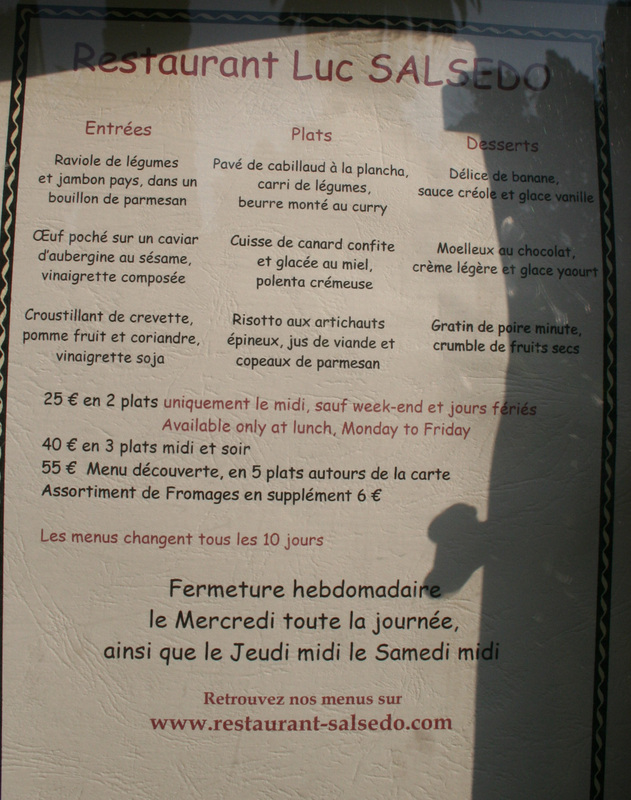 At other times the cost is 3 dishes for 40 euros, which is still a steal considering the level of cooking. 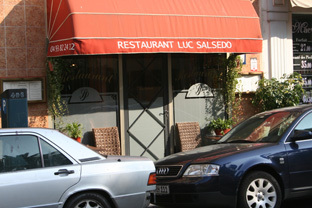 The Menu at Luc Salsedo consists of only 3 entrees, 3 main plates and three desserts. The menu changes every 10 days.